Alexandra Grant assesses what she considers the human body's six "portals": sight, sound, touch, smell, taste along with thought. In doing so, she's created six massive paintings full of geometric shapes, backwards word and dense bubbles of information. From the OCMA bio: Alexandra Grant was born in 1973 in Fairview Park, Ohio; lives and works in Los Angeles. Grant is a graduate of Swarthmore College (BA, 1995), and California College of the Arts (MFA, 2000). 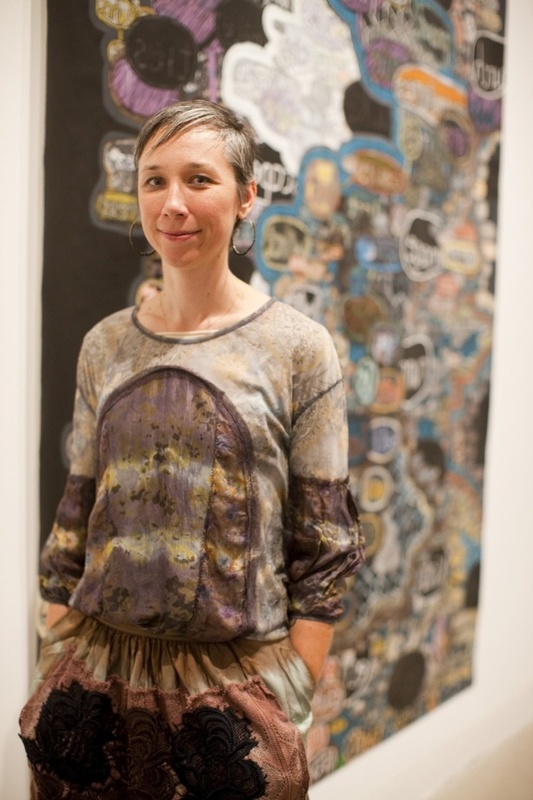 She has had solo exhibitions at the Museum of Contemporary Art, Los Angeles, and Honor Fraser Gallery, Los Angeles, and her work has been featured in group exhibitions at the Contemporary Museum, Baltimore; the Center for Contemporary Art, Tel Aviv; and other galleries and museums in the United States and abroad. Grant is a founding board chair and artist with the Watts House Project, an artist-driven initiative to redevelop the homes across the street from the historic Watts Towers in Los Angeles.